Guess who is hitting the boxed wine tonight big time, all thanks to the pain of petite wedding dress shopping… ME! 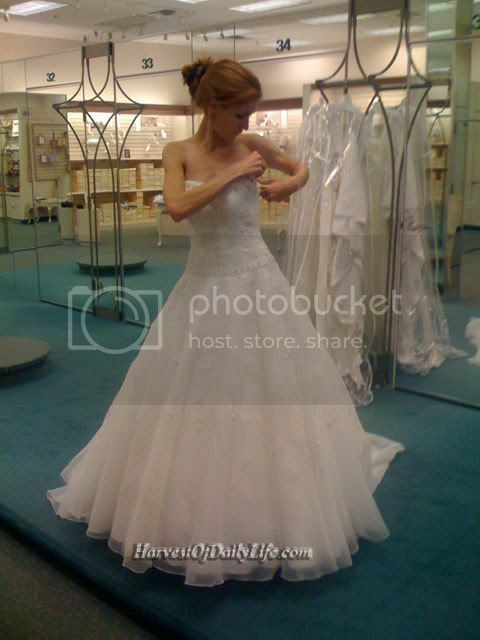 We went to David’s Bridal and I tried on several dresses. The one we loved was Oleg Cassini CT258 and it was on display in the window of the shop. We looked through all 12 of the dresses in the shop that were in my size. Nothing was coming close to the dress in the window (which is very similar to the initial Jacqueline Exclusive #9811 dress I found) so we told a consultant we love it and wanted to try it. It was a size 4 and it was about 4-6 inches too big on me. It was also $1100 which is out of our budget. The consultant pinned the dress to give us an idea of how it would fit me if it were my size, it looked amazing but I was still swimming in it. They said if we bought it in the next 24 hours they would take $200 off the price with the sale that was only running for another 24 hours. They also offered to order in the size 2 for me but I had to buy it first before knowing if it would fit or look nice. I am sorry but I can’t stomach paying that much for a dress plus how can I feel good about buying it without trying it on? Additionally I’ll have to pay for alterations on top of the already out of our price range cost of the dress. And there are so many ladies on craigslist selling dresses who were suckered in to buying a dress they loved in a size that the store didn’t have in stock to later learn that the dress didn’t fit them. Ugh, no thanks buddy! On the positive side I did get to try on a dress that I sort of liked that WAS my size. It was my plan B dress though… It is a David’s Bridal #T8017. The picture on their site makes it look way poofy. When I put it on it looked nice. N and I both liked it but preferr the other style dress much more. Here are the shots of me in it. To all my midwest blogging buddies, if I find one on craigslist in a city near you will you scope it out for me and let me know if it is actually in good condition before I rent a car to drive to the dress and try it on? I would love you forever! Loris last blog post..A sandwich by any other name, is not always a sandwich! Oh crap, I am not drinking, and yet it double posted! sorry, no idea why that happened! I remember that finding “the” wedding dress I wanted was the most fun and most horrendous time of my life. Anyway, if you find any in WI let me know:) Have a great time with the wine tonight! @Lori: That is a great idea, I might take your advice this weekend! Hey, if you find one close enough in Michigan (within 60 miles of Ann Arbor), let me know. Seriously. I’ll bring it to you. You look gorgeous in those 🙂 But I agree with Teeni, you have to feel like you love the dress. I had the same issue with sizes when I shopped for my gown (years ago). The dress I wanted was $1100 at David’s and a few other stores. I ended up buying the book Bridal Bargains and it suggesting finding a gown distributer who could find the dress I wanted. She ended up finding it for me for about $350 (new). Dress shopping can be quite the undertaking. Cheers to the wine! So which on did you find on ebay? I loved the first one you tried here, the second one looks like Cinderella to me. Oh, and did you know it snowed at the North Rim on Saturday? Just a few flakes, but snow just the same. Snowed on the SF peaks, too. Felt like snow here at “only” 7500 feet but didn’t. Yes, which dress did you find at ebay? I prefer ebay to freecycle. @Karen: The first one… I am sort of amazed. The 2nd one looks like a princess dress!!!! I love it, but it might be a bit out of context at an outdoor wedding. Keep us posted on the ebay one!! @maiden53: It did? I’ll tell N. How cool, we are going to miss the snow. I have the t8017 in a size 8 if you would be willing to get it altered. I had the top layer of tulle removed to make the dress sparkle more. There is a small rip at the bottom of the dress but it is really hiddend because of all the tulle. I would be happy to send you photos. I am looking to get about $200 for it. It has the professional bustle already added. Let me know if you are interested, I am willing to negotiate. I don’t have room in the closet for it anymore. @Laura: Thanks for the offer, how did you find my post? Please do send me photos talinanorris[at]gmail[dot]com, we are considering all options at this point. OMG. You look absolutely stunning! Simply gorgeous. I got very lucky with my dress. Bought it from a small store that was going out of business. I felt so bad for the owner (she was nearly crying while helping me get fitted), but I did snag a huge discount because she had to unload merchandise quickly. Got a $750 dress for $200. I hope you find EXACTLY what you want! I had that same horrible experience while looking for the same dress in new orleans!!!!! i feel your pain…so glad you found one for such a good price…when is the wedding??? are you planning on selling your dress after?? I really love it but I just dont want to give any business to davids!!! hey. i just purchased a gown from David’s Bridal last night and tried on the very dresses you have on in your pictures. I settled on J9869 (beautiful) on a Size 4 eventhough I am a Size 2 which the store didn’t have at the end. In the end, I paid the the alteration costs listed below 🙁 which on hindsight, is way too much. I wish now I had waited for the Size 2 to come in. You look fabulous in every dress dear. You don’t need to drink. Kudos to you! simply but looks like elegant !! Thanks for sharing your awesome photos..